With everything in life we must apply different behaviours to achieving different goals. For example if you want to run a marathon you choose your date and you know that your goal is to complete 26 miles in a particular time on that day. You set yourself a training plan that’s suitable for your level of fitness and you accept that it will take time to get to the finish line. Over the course of your training journey you will have good days and bad days and some days you feel like you are running on quick sand. But you know that if you stick with it over the long term and work through the highs and lows, you will achieve your goal and get to the end of the race. The principles applicable to investments are similar…your goals are what you are trying to achieve in terms of return and how long you have to do this and how much pain you are willing to take over the investment period in order to maximise your return. Investors will never achieve their investment goals ‘sitting on deposit’ waiting for the right time to invest. The fact is there isn’t a right time but if you give your investment enough time and you take appropriate risk, then you will get there. 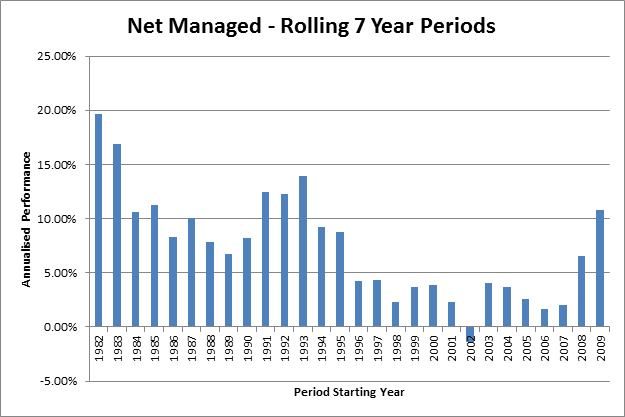 The graph below shows the benefit of long term investing, looking at 7 year rolling time periods. There are 28 seven year annual rolling periods, and all bar one has been positive. The point here is to invest your money and let it work for you over time, compared with just leaving it in cash. Not everyone has the risk tolerance for a managed fund type structure which is why a multi asset risk targeted approach has something for everyone and the same logic applies.With risk targeted funds the your investment goals are more aligned to your risk appetite. Identify your risk appetite, knowing that the returns may not always be positive but that over time they will be rewarded for the level of risk that they take. A lot of us have lost sight of the concept that successful investing is about TIME rather than TIMING. It’s practically impossible to consistently get the timing right particularly in the world we currently live in, but if you have enough time you can afford to take more risk which will ultimately result in better returns. You just have to stick with it through the quicksand and the best advice is don’t delay, invest today!